shutter | What? Why Bother? I saw some random camera bits on eBay the other week, bidding starting at £10. It wasn’t completely obvious what some of the things were, but some of them looked useful – the small lens hoods looked like they’d fit my Voigtlander Vito B cameras. 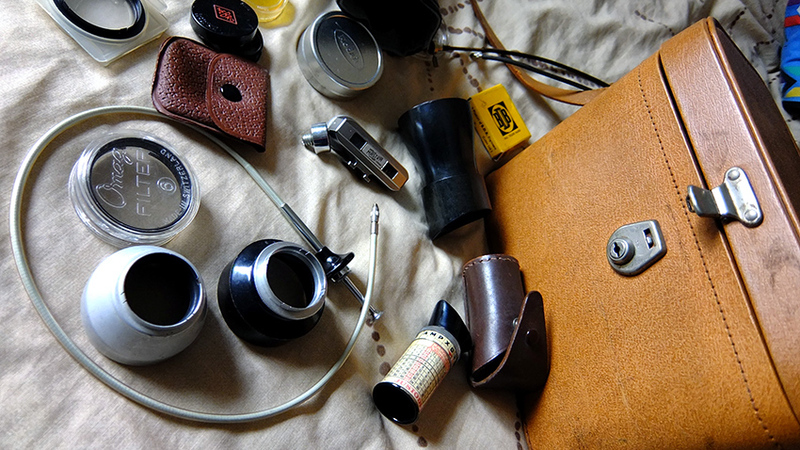 There were a few filters in there too, and a rangefinder, surely some of these would be useful. So I put a bid in. Small lens hoods: both 30mm and I need 32mm! No use to me at all! Monocular: Seems to work fine. Do I need one? Not really. Rangefinder: Numbers are almost too faint to read, but it works. Filter Pouch: Ok, I could use this. Probably won’t. Small Metal Thing: It has small thread and large thread, no idea what this is! Filter Box: A disappointingly empty filter box. Am using it to store a filter. The weird thing with the numbers on it and an eye piece is a kind of exposure meter, which as it has almost no moving parts, is still in working order. The numbers on the rangefinder are almost too faint to read, but it works. The small black lens hood unscrews to fit the filter glass, I’d never seen one like that before. So I bought one that fit my cameras and now I can use the filters, and there is less to mess about with when taking photos as filter and hood are one piece. 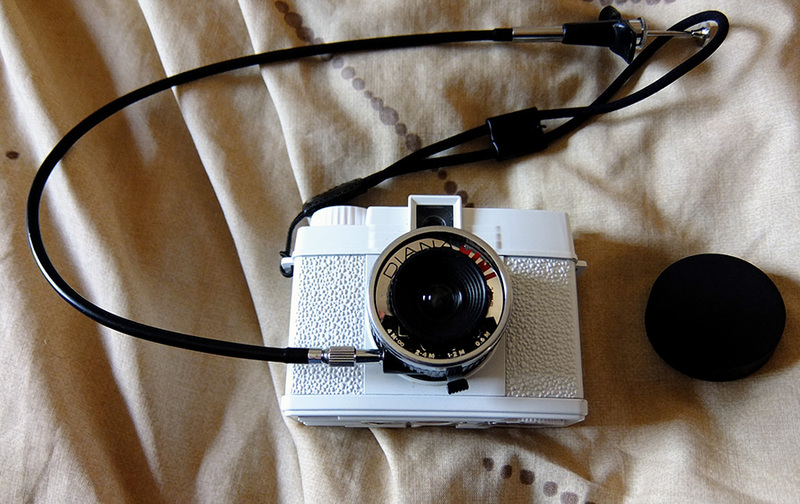 I got the camera built in about an hour, that was good fun – I enjoy building things. I tested the shutter (looked through the back while clicking) and noticed it only worked properly about 50%, the rest of the time it got stuck open, or stayed open while my finger was on the trigger, both would have lead to massive over-exposure of the film. I thought it might improve with use, as it loosened up. It did the opposite. Plus, the film ‘counter’ wasn’t counting. It doesn’t actually count, the wheel just goes around to show that you’ve advanced the film by one frame. Well, it wasn’t doing that, even. A quick search later, I find that both are common problems. After a bit of further digging and some experimenting of my own I solved them. The Shutter: Don’t over-tighten the spring-loaded thing between the shutter and the round thing that turns when you press the shutter release thing. It should be just tight enough to do the whole shutter thing and no more. Try to get this right first time, I had to take the camera apart to fix this, and snapped a couple of things off that shouldn’t be snapped. Film Counter: Squeeze the case on the back at a point halfway between the film advance winder and the ‘counter’. This seems to work. I’ve had to waste a film to play around and discover this, but as it was only from the pound shop anyway, it doesn’t matter that much. The viewfinder looks surprisingly bright for something that requires no batteries, but not sure how much use it is with the focussing.